Well before we were a Grove, a few of us had started honouring the seasons and calling in the quarters, etc. after some of us attended Philip Carr-Gomm’s workshops in Auckland and Wellington in 1998. Philip is Chosen Chief of the Order of Bards, Ovates and Druids in the U.K. 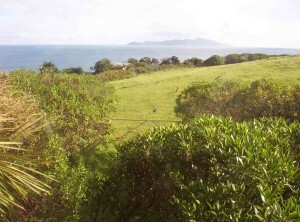 These seasonal events were held at ‘The Woolshed’, a beautiful farm of 52ha at Pukerua Bay outside Wellington. Philip and his family came to New Zealand on sabbatical in 1999 and Philip created the Grove of the Summer Stars at ‘The Woolshed’ where the family stayed for 6 months before renting a house in the same area. The Grove is a true grove of native trees (te kouka, kowhai, horoeka, kawakawa, ngaio, mahoe, horoeka, karaka, whauwhaupaku, pohutukawa, etc.) set in a natural bowl in the land. The physical location of our Grove is important. We cleared it of gorse and rubbish and clothed the Grove herself and the walk in with many varieties of native plants to provide a place out of space and time where we could hold our rituals. After Philip’s first visit many of us enrolled in the Bardic Grade so we had a bit more knowledge to go on. We have a beautiful banner depicting our sea, land, island, trees, our name and the local legend of the ‘Summer Stars’. We honour the 8 seasonal festivals. We meet at The Woolshed/Grove of the Summer Stars at 11am on the nearest Sunday to the particular festival, except for Beltane and Samhain, which are held at night. 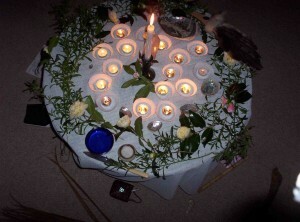 Lughnasadh is held on the Sunday during Druid Camp even though it is a little early, i.e. the third week of January (Wellington Anniversary weekend). There are approximately 25 OBODies (Bards, Ovates and Druids) in our Grove and around 20 ‘supporter/attendees’. Most seasonal festivals are attended by at around 30 people and these are not always the same 30. The invitation to attend is extended through the website and the monthly Woolshed Programme sent out to approximately 380 people around New Zealand. The Quarter Festivals (Beltane, Lughnasadh, Samhuinn and Imbolc) are for OBOD members of the Grove of the Summer Stars only. The Sun festivals (both Equinoxes and both Solstices) are open to all and we look forward to welcoming you here. All people who attend are seeking connection with spirit in Nature and are always respectful and eager to participate. New people are either brought by other ‘Grovers’ or they have read about it on The Woolshed website and have asked if they might attend. It is made very clear to all new people that they are expected to respect the land and the ritual and participate, i.e. join the Circle – no observers! A new person is often assigned a ‘buddy’ to look after them, explain any ‘housekeeping’ matters and make sure they feel safe. Our Grove is based on the values of respect, equality and spiritual safety. We use the OBOD rituals as received in the Bardic Grade correspondence course as a ‘spine’ and then incorporate Maori and other elements important to this land, this place, our traditions and our people. Being in the Southern Hemisphere, we reverse the order to fit in with the correct season. As the farm is situated in a very ‘weatherly’ position and ‘The Woolshed’ is a very large barn converted into living and workshop spaces, we decide on the day whether to hold the ritual inside or outside. Everybody brings a food contribution for the feasting afterwards. As a Grove we make decisions informally, usually after each seasonal ritual. If something comes up in between we email and have also recently set up a closed Facebook group that is working really well – good discussion, good will, and humour. We have no subscriptions or dues but a koha (contribution) basket is put out at each ritual. We don’t have a leader or want one. The ‘Modron’ owns the land on which the Grove is situated and is happy to take responsibility for some of the organisation and administration work. OBOD members take responsibility for individual seasonal rituals. We have a ‘Grove Master’ who is responsible for making decisions about what we plant in the Grove and on the land and at each seasonal festival he reminds us what is happening within the plants and within ourselves at this time. Our Modron is also a registered marriage and civil union celebrant who is in demand to provide ‘druid-like’ marriage ceremonies and civil unions.